The goals of the workshop were to foster the growing awareness of the benefits of interdisciplinary studies in archaeology and conservation university programs and to promote the development and implementation of such courses into the curricula of these departments. There are approximately eight graduate programs in North America that offer a degree in the conservation of art, architecture, or archaeological materials. Most universities offering degrees in archaeology are not privileged with a conservation department on campus and many fall short of including conservation in their archaeology curriculum. 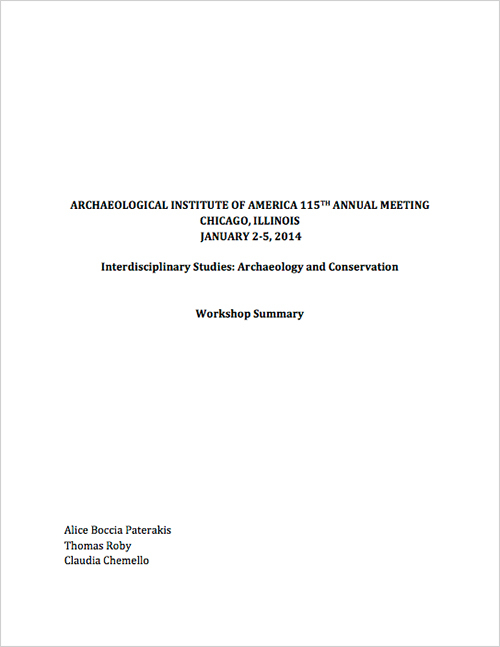 Conservation programs in North America can likewise benefit by a review of course requirements in their archaeological conservation curricula and the incorporation of fundamental education in archaeology. One of the goals of this workshop was to lay the groundwork for the advancement of education for future archaeologists and conservators.